When I first visited the FLX (for new readers, the Finger Lakes of Upstate New York) back in October 2004 the most exciting wine tasting was my last one at Hermann J. Wiemer on the western bank of Seneca Lake. During that tasting Hermann introduced me to quite a shy young man called Fred Merwarth and it was clear to me that he was Hermann’s potential successor. Since 2007, with the help of Swedish-born Oskar Bynke Fred has built on Hermann’s considerable successes in a way that is both systematic and creative. One day soon Oskar will get his own blog posting, but this one belongs to Fred and is composed largely of quotes from him during my tasting at Hermann J. Wiemer yesterday afternoon. 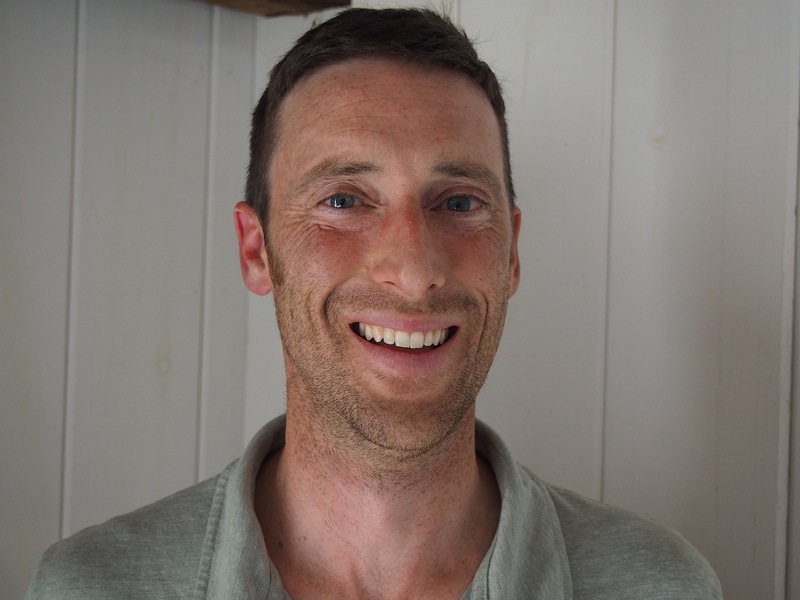 There was nothing shy about him then, and the following is an in depth look at the perfectionism with which he crafts these great FLX Rieslings. The 2014 Dry Riesling from Wiemer is a very elegant wine with the kind of finesse a lot of FLX producers struggle to get anywhere near to achieving. 65% of the blend was made from grapes born in the home HJW vineyard, 23% came from the Josef vineyard and 12% came from the Magdalena vineyard, the latter both in a warmer site some miles to the north of the winery on the western side of Seneca Lake. “We shoot for three bottlings per year of this wine and they’re very similar to one another. The only real difference is that each lot is filtered immediately prior to bottling, so the later bottlings have more character from the yeast. Because we keep them so cold we manage to hang onto all the natural carbon dioxide in the wine.” This sounds like details, and for some winemakers it is no more than a detail which can be ignored, but that carbons dioxide gives this wine more brightness and liveliness. I could have sat with it all afternoon, but I had to taste all the 2014 Rieslings with Fred. As he poured the next wine, a cask sample of the dry 2014 HJW Vineyard Riesling Fred explained, “this is collection of 15 different pickings harvested between October 12th and November 8th. The moment I know that the HJW Riesling grapes are ready is when the taste changes from tart lime to ripe lime.” The wine has a pristine yellow apple and tangerine bouquet, it tastes super-racy and this is balanced by a discrete pithy quality that underlines it’s understated power. “We had to walk the line on that pithiness as a textural component. The late-picked lots didn’t have it and by themselves came off a little heavy as a result. So we needed to put the best of the early-picked lots from this site in the blend.” The word “blend” is something a lot of wine geeks and somms don’t like to hear in connection with single-vineyard wines, because it suggests that somehow they’re not pure or authentic. However, the truth is that even if a single-vineyard wine starts life as one lot of grape juice putting that into two vessels to ferment always results in two slightly different lots of wine. So blending is almost inevitably an important skill for the maker of single vineyard wines. Yet more generous and succulent is the 2014 Riesling Reserve, which is packed with ripe yellow fruits and has less prominent acidity than the other dry 2014 Rieslings from Wiemer. “Sunday, Monday and Tuesday we put all of these wines up on the bench to taste them as a group. It’s a body of work and they each have very individual identities. This is a much more textural wine than the Dry Riesling, even if that also has some textural qualities.” At the opposite end of the scale is the crisper and sleeker 2014 Semi-Dry Riesling with its effusive apple, pear and citrus aromas, great freshness and a lightness that is reminiscent of a German Riesling Kabinett. You could analyze it, or just lie back and enjoy it! The two 2014 Late Harvest Rieslings are both marked by noble rot of the blest kind (every vintage Botrytis develops differently, marking the wines made from nobly-rotten grapes differently). The regular bottling is succulent and elegant with a near-perfect balance of sweetness and acidity. “This has to go into the bottle perfectly balanced. If it is too sweet or too acidic at that point bottle-ageing isn’t going to change that.” The 2014 Josef Vineyard Late Harvest is perfectly golden in aroma and an even more stunning harmony. 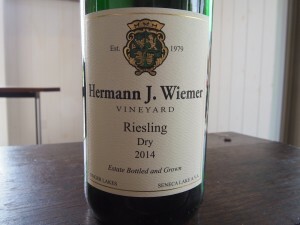 “There were four possible blends of this and it was really hard to decide, because they all really had something.” I would add – with great British understatement – that all the 2014 Rieslings from Hermann J. Wiemer really have something and that it was a joy to taste them, as it will be to drink them during the coming months and years! PS Space and time are too short to describe the other 2014 wines from this producer, but just as Oskar deserves a posting to himself, so do the Cabernet Franc reds! This entry was posted in FLXtra, Home. Bookmark the permalink.